. . . no small feet: Glacier whitewater could've been a fall from grace - oh, wait - what grace? Glacier whitewater could've been a fall from grace - oh, wait - what grace? In case you need to catch up, my family stayed at my folks' house while our floors were being refinished. We ended up getting a stomach bug while we were there. I'm not at all surprised that my siblings didn't call to inquire how we were doing . . . but as a middle child I am forever looking for opportunities to over-share how annoying my siblings can be. Here's my chance. A few years ago, my brother, Pat, and his four kids traveled to Yellowstone. My dad went with them. Pat's wife stayed home to work, because she couldn't take off additional time from work. Their family was planning to visit her family in Ireland later in the summer. 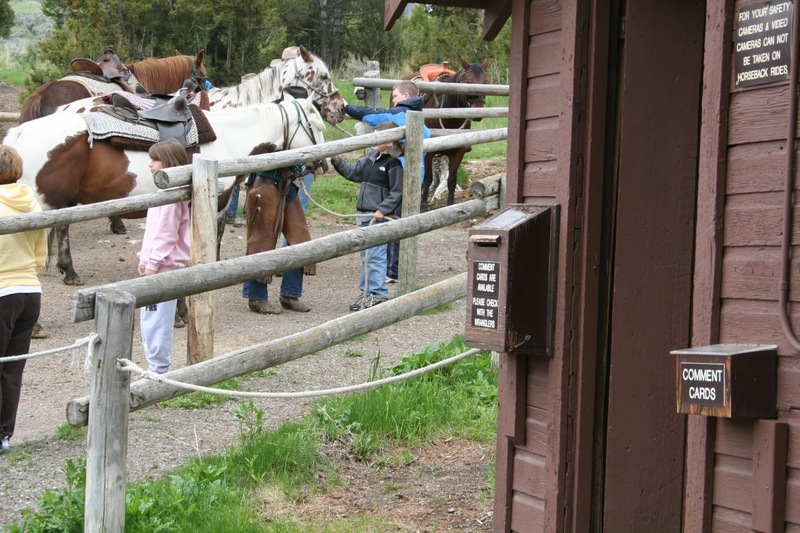 On the second day there, my dad agreed to go on a horse trail ride with my 11 year old niece. Pat's other kids were too young to go, and Pat is very allergic to animals. They decided it would be easier for Pat to stay back and entertain the other kids during the one hour ride. Dad's horse got spooked in the yard when they arrived back at the barn. He was thrown from the horse and almost killed. His leg snapped off at the hip and he required surgery to reattach it. In addition, he suffered six broken ribs, a collapsed lung, and a brain bleed, which was dangerous because he is on blood thinners for leukemia. This is the same stable where my dad was thrown from his horse. I took this photo back in 2010 when Coach and I camped out with the kids in Yellowstone. First time ever camping. Real smart. That's a blog post all in itself. Another time, perhaps. It was a very scary time. My dad, who was 76 at the time, shocked all of the doctors by making great strides and recovering so quickly that he was able to fly home a few weeks later with the help of my brother, Mike. He stayed in various rehab facilities for about 4 more weeks before he could go home. Today he walks without a cane and has recovered completely. This stressful event revealed some interesting dynamics. Marie acted as if HER father had been seriously injured and the rest of us were all just well-intentioned neighbors who were showing up now and then to offer our support. It was nauseating. At one point several weeks after the accident, Pat sent out a group email during his family's trip to Ireland to ask for the number for the cell phone that we bought dad. Pat wanted to call Dad at the rehab place. Marie emailed him the number. She also informed him that she called Dad each night at 6:00 pm. Dad would be expecting her call. In other words, Pat would not only need to consider the time difference before he placed his call, he would be expected not to interfere with Marie's reserved phone call time slot. Someone felt like 'the chosen one.' Oh, believe me Marie was given every bit of encouragement that she was in fact 'the chosen child'. Well, the chosen daughter anyway. Pat, on the other hand, has always been the chosen son. He and I are Irish twins. His arrival marked the introduction of a male heir. In an Irish family. Need I go on? He kicked me off the throne before my first birthday and has been ruling the roost ever since. Pat brought Dad to Yellowstone, witnessed his horrible accident, but rose to hero status in the process. Incredible considering this brother of mine already walked on water in the eyes of my parents. Who knew his position could be elevated? 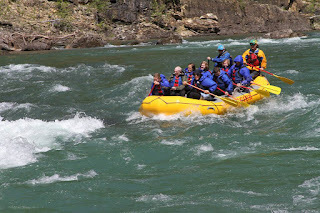 Our tame and thankfully uneventful white water rafting adventure. I found it interesting and mildly entertaining (it would've been more entertaining had the circumstances been different) to observe Marie and Pat try to jockey for position as the favorite of the favorites. As a nurse, Ann was involved in my dad's health issues from the get-go. She didn't need to maneuver for position in the sibling hierarchy because as a single mother, my parents are rarely without her influence. She christened them her support system forever ago. So, she too is in like Flynn. Not necessarily as the chosen one, but as the offspring most in need of them. My youngest brother, Mike, and I manage to enjoy our peripheral position orbiting all of the nonsense. I insist that Mike has a leg up on me, because he is after all a male. In an Irish family. Are you catching on to the pattern here? 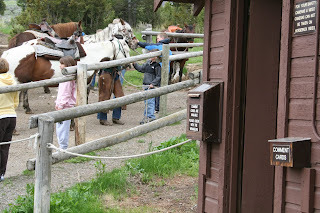 A few weeks prior to this Yellowstone visit, Dad accompanied Coach, the kids, and I to Glacier. What can I say, the man is a national park junkie. Anyway, Coach and I agree that had Dad been thrown off the raft during our white water adventure and received any kind of injury, I would've been lynched. Hours after learning of Dad's accident, Marie referenced this possible scenario. Marie: 'Oh, I know. Mom and I were so upset that you took Dad white water rafting.' Oh, the thought of their discussion of my involvement in Dad's white water rafting choice burned me up. I loved this little private tribunal that was not shared with me until now. , the white water was very tame at this location. I think the time of the year had something to do with it. The woman behind the counter insisted that he would be fine - she kept reassuring me as I argued with Dad that he need to sit and read his Agatha Christie book. So, while I'm thankful and relieved that Dad wasn't seriously injured while vacationing with us, I know that I wouldn't have been raised up to prominent status as a result. I suspect strongly that my siblings, who haven't called me since the stomach bug sharing that went on last week at my folks' house (although they don't reach out to me regularly anyway), are rallying to get me written out of the will. Ugh! Family dynamics are the worst! And the bigger the family, the more complicated. Your Dad's recovery from that accident is amazing though! It was really amazing that he recovered as well and as quickly as he did. My one sis wanted to fly him home on a private airplane and split the $12,000 bill between the kids. She just felt guilty that she wasn't able to go out there and be with him. On a sibling conference call, Coach (the voice of reason) pointed out that there was a reason he was in a hospital - he needed care. It made no sense to move him. He ended up making great strides much faster than the doctors anticipated, so he was in a rehab place out here in a few weeks time.